This puzzle will test your imagination. 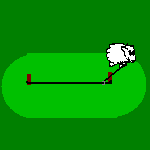 How to tie a sheep so that it eats out a square in grass? 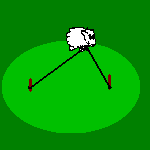 We have one sheep ropes pegs and rings. Look at the oval how the straight sides were created. 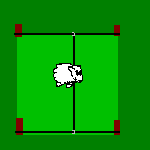 Tighten two ropes between corners of a square. Put one ring on each rope and tighten another rope between them. 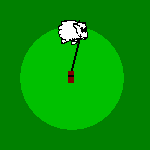 That rope goes through the ring on sheep’s neck.